We're officially halfway through and Ibiza really ran away with this one! Then again, I don't blame you ladies. 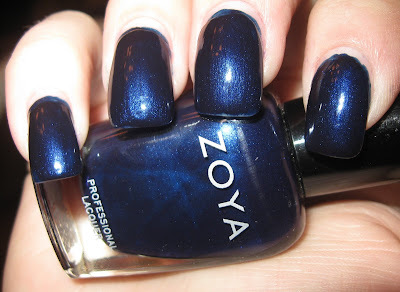 Zoya Ibiza is a deep, rich blue that reminds me of the ocean in the moonlight. Just the slightest hint of shimmer blended with a metallic finish! Hands down, Ibiza is my favorite blue and per usual, the wear was fantastic. Tomorrow's theme is going to be called "Always the Bridesmaid…" and it will feature Tao and Reva going head to head for your vote! So what do you say, ladies? Which bridesmaid is finally going to find her Prince Charming? And who else hopes he's the Charming from ABC's Once Upon a Time? Ibiza looks great on you! My vote is for Tao! I love Once Upon a Time! I'm more prone to pinks and reds, so my vote is Reva. Reva and I LOVE Once Upon a Time! My vote is for Reva.